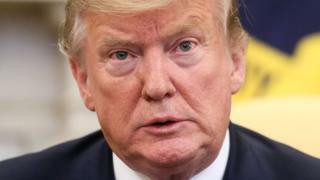 US President Donald Trump has said he would be "disappointed" if North Korea is confirmed to be rebuilding a rocket launch site. "I would be very disappointed if that were happening," Mr Trump said on Wednesday in response to the reports about the launch site. "It's a very early report. I would be very, very disappointed in Chairman Kim - and I don't think I will be - but we'll see what happens. We'll take a look. It'll ultimately get solved." The new satellite images, coming from several US think tanks and testimony from the South Korean intelligence service, appear to show rapid progress has been made in rebuilding structures on the rocket launch pad. However, the BBC's Laura Bicker says the renewed activity may just be Pyongyang's way of sending a reminder to Washington that it has the technology to build weapons. A historic first meeting between the two in 2018 in Singapore produced a vaguely worded agreement on "denuclearisation" but little progress. Video Trump-Kim summit: Who came out on top?